You've probably heard it before: a timid coxswain. She uses a lot of "Urns" and changes her mind mid­-call. "Port row, no starboard, I mean... weigh ' nuff." Or perhaps the coxswain knows what to say but his vocal tone is small or nasal, and he doesn't command attention. Whether the timidity comes from caution or lack of confidence, these inhibitions keep a coxswain and her crew from achieving all they can together. A coxswain's job is always going to be difficult but if you have a clear, powerful voice and the knowledge to back up what you say, rowers will take notice. Ashley Albert is smiling. She just found out that four of her choir students have been accepted to the All-National audition-only choir for the best singers in the country. In fact, she hasn't stopped smiling for the five years she's been the choral director at Brunswick High School in Maine. Throughout her tenure, her school is the only one in the state of Maine that has sent students to the All-States, All-Eastern, and All-National choirs each year. But, there was a time in the not-so-distant past when there were no smiles. In fact, Ashley Albert thought that her dreams of being a music educator were over. When Albert was a senior, she was cast as the lead in her high school production of Godspell, but something was wrong. She was fatigued and her voice was raspy. A week before the performance, her voice stopped working. "I could only sing five notes," she says. The vocal specialist she went to see inserted a special camera called a stroboscope down her throat to video her vocal chords and said two words, "Oh... no." "I was so shy when I was in high school that I used a high-pitched, timid, whispery voice," she said. That voice had left her with nodules on her vocal chords that the vocal specialist could see clearly with the stroboscope. 'T d been accepted into college and I thought they wouldn't let me in if they knew about the nodes, so I didn't tell them." Not at first, but once she matriculated into the music educator's program, she had to tell her voice teacher. To this day, the voice teacher's responses, "You'll never be able to model correct singing" and "You won't amount to anything" still sting, but they only made Albert more determined. In her journey to becoming a successful voice coach, this was a first step, and the one that made her aware of vocal health. "It [the fatigue that caused her vocal nodules] taught me that there are actual limits to the human voice. I can tell when my own students are vocally fatigued, and I know how to help them." 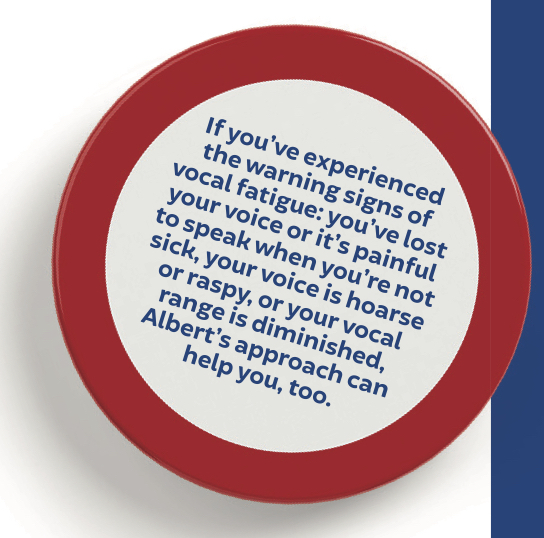 If you've experienced the warning signs of vocal fatigue-you've lost your voice or it's painful to speak when you're not sick, your voice is hoarse or raspy, or your vocal range is diminished-Albert's approach can help you, too. For Albert, her vocal nodules led to intensive vocal therapy with a specialist to help her find her true, resonant voice. Ideally, you use your resonant speaking voice in-and out of-the boat, but what is a resonant voice and how do you find it? Resonant doesn't mean lower in pitch. Instead, it is your clear and natural sound that rings with confidence. First, close your eyes. Take a few deep breaths and relax your throat and face. Hum. The sound that comes out should be the pitch that is most comfortable for you. Now, scan your body to find the vibration of your humming. You'll feel a true and resonant pitch vibrate in the middle-top of your mouth, in the front of your face, below your nose, and/ or in the sinuses below your eyes. Those with deep voices might feel the vibrations in their collarbone . Put your fingers gently on your face and feel it. Once you find that resonant tone, open your mouth and make an "O" sound. Add the consonant "M" and switch back and forth between "moe" and "moo." Come back to that same comfortable humming pitch, and open your mouth to say some silly sentences like, "My mom made me mash the M&M's." The M-leading consonant will help you transition from the hum to the words. Take a deep breath. Do your shoulders rise? Does the breath stop high in your chest? Now exhale forcefully. Do your ribs collapse? A supported breath is one that employs the diaphragm, a parachute­ like muscular structure below your ribs. When it contracts it increases the volume of the lungs. To see this in action, lie down and rest your phone on your belly button. Breathe deeply. As you inhale, your belly should expand and your phone should rise. As you exhale, your belly will contract and the phone will lower. While still on your back, forcefully say "ha-ha" or "ho-ho." Notice the movement of your diaphragm. If your phone is still on your belly it will jump a little. You may have already had this experience playing the game "Belly Ha-ha" with someone's head on your belly. Their head will bob up and down as you forcefully say, "Ha!" and it's hard not to laugh. When you're in the middle of a race and asking your crew to give all they can, you'll need to use the power of your diaphragm to support your voice. Hard consonants that start words like power or port require a lot of air. Running out of breath will hinder your calls, so work on your breathing to increase your abilities. Place three fingers just above your belly button and say the sound "Ts." It will sound like you're a punctured tire. Exhale, and as you do, push your belly into your fingers. Try to imagine the ribs expanding. If the opposite happens, and you collapse in on yourself, your lungs won't have the space to work to capacity. Instead you'll look a lot like jumbo shrimp! Imagine how hard proper breath support could be all scrunched up in the boat. Exercise your lung capacity by becoming a human beat box. Stand in a Wonder Woman or Superman pose with your legs shoulder-width apart and your hands on your belly. Say "Ts," "Ck," or "P" and feel the diaphragm pushing against your hands. If you don't feel it, go back to the breathing on the floor and Belly Ha-ha exercises. If you do feel it, you might also feel light-headed. This is normal; you're probably expelling more air than you usually do. Learning how to breathe is integral to your vocal success. By design, coxswains are the smallest person in the boat; any shyness you have will be tested. To try to understand how the rowers hear you, get nose length from a wall and try some commands. Your voice will ricochet off the wall and you'll experience it as others do. Added breath control will help with your volume. Warm up your vocal chords and increase volume by playing with a lip buzz. The lip buzz is the noise little kids make when they pretend to be a boat or a motorcycle. As your lips vibrate, allow your pitch to rise and fall similar to the sound a siren makes. Turn from the wall and imagine your voice as a laser coming from your forehead. Focus it on a point 40 feet away-about the distance from a stern coxswain to her bow rower in an Eight. As you loosen your voice, lose your inhibitions. Try doing the same exercise standing on a chair. The added height will add to your confidence . Your voice is your unique instrument as a coxswain, but at the end of practice you still need your voice for communication. You wouldn't let your rowers go out and tackle 20-minute power pyramids without a few dynamic stretches, and you shouldn't neglect warming up the muscles that you depend on, either. Find time for the humming, lip buzz, and breathing exercises as you drive to practice, or as the rowers warm up. Hydration is important but water doesn't actually moisten your vocal chords . The anatomy of the throat is such that the epiglottis, a flap of cartilage at the top of your voice box, keeps food and liquids from making a wrong turn and going down your trachea. The trachea is part of the respiratory system and helps you breathe. Food and liquids continue their journey over the closed epiglottis to your digestive tract through your esophagus. When water slips past your epiglottis toward your vocal chords you'll know it. The coughing that follows is trying to expel the water from the "wrong tube." The proper way to moisten your vocal chords is to breathe in steam. Try a steamy shower or use a sink. Drape a towel over your head, sink, and the faucets and then turn on the hot water. The steam will fill up the tent you've created. Breathe deeply and enjoy clearer sinuses and moistened vocal chords. These exercises, intended to help Albert find her voice, had her scurrying for privacy. Says Albert, "I was sure my roommate thought I was possessed, so I sat in my car to do my vocal exercises." Remember, as silly as you think you sound, these exercises will strengthen your voice. Before you begin, record your voice. Then, after you've completed a few weeks of the exercises, record yourself again. Listen to your progress. You might have to lose your inhibitions to practice some of the preceding vocal exercises, but keeping your voice healthy is a crucial step on the way to becoming a world-class coxswain. Hard consonants that start words like power and port require a lot of air. By design, coxswains are the smallest person in the boat; any shyness you have will be tested.